…Among the audience members at St. George’s Church last weekend was Second World War veteran Bill Winegard, a former member of Parliament and former president of the University of Guelph. Now 90, he criticized the Stephen Harper government over its treatment of war veterans during a Remembrance Day speech in Guelph this fall. Veterans need federal help, he said, referring to 160 suicides by Canadian military personnel during the past decade. This past weekend, he spoke to U of G choir director Marta McCarthy after the concert to voice what she calls “probably the most moving compliment” she has ever heard from an audience member. Peace rather than war is the theme of “Oh Great Mystery,” an arrangement by Timothy Corlis of a centuries-old Christmas matins chant reworked earlier by Byrd and Palestrina, among other Renaissance composers. This seemingly simple piece is written in four parts with a cello accompaniment. Unlike much of the interwoven lines of polyphony favoured by those Renaissance composers, the Corlis setting contains a single dominant voice, with the other voices stacked above and below it from one note and bar to the next. Basically, the choir sings a succession of often-repeated chords all the way along the score. Much of the power of the piece comes from that repeated motif and from the dynamics, ranging from fortissimo to pianissimo and even pianississimo. Mostly it’s on the quiet side, posing an extra challenge for a large choir in maintaining pitch. You listen to each other really closely in that situation. Live wires run not just between choir and conductor but also back and forth among choir members. Not only do you hear the music, but you also feel its touch, moving among you like a live thing. Something drew enemy soldiers out of their trenches to meet in no man’s land. Something else draws together voices to meet in a different kind of communion. Oh Great Mystery indeed. 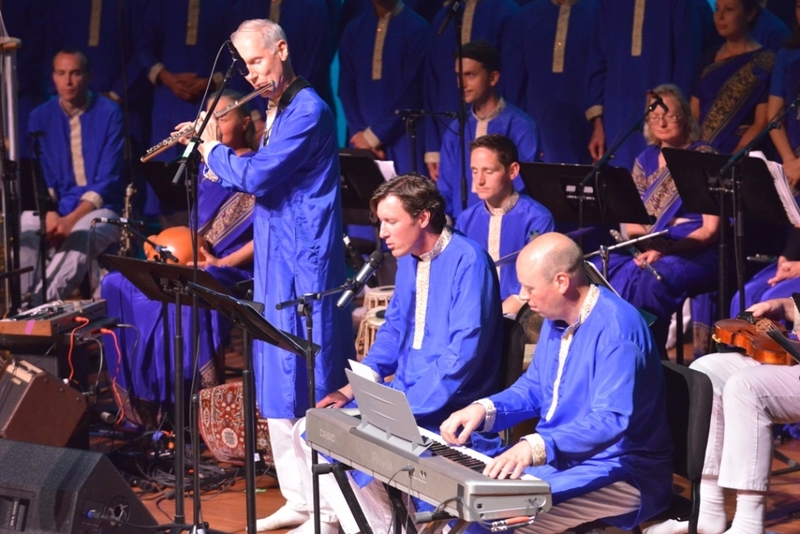 I feel deeply privileged for the opportunity to perform with the Gandharva Loka Orchestra. 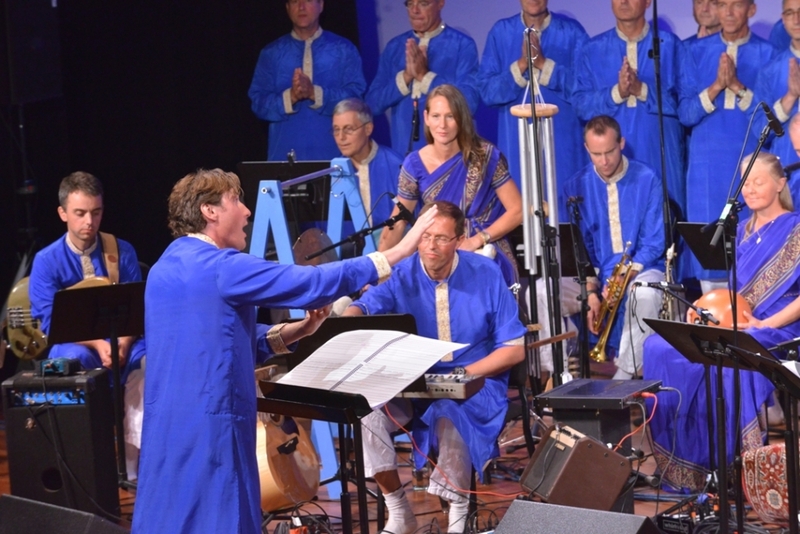 Concerts in August honouring peace advocate and spiritual leader Sri Chinmoy. Galiano Island, Vancouver, and New York City. …directing a new work celebrating the 25 Anniversary of the Gandharva Loka World Music Stores.